Now that I've started decorating our new house (we've been living in it for about two months now! ), I thought I'd share some "finished" (let's be honest and just call it "progress!") shots. So, yes, right now I'm jumping all over the whole wide timeline spectrum as I'm currently sharing posts from the building process, tours of the empty house right before we moved in and now photos of the finished spaces with furniture. Hot mess express over here, but I'm just so excited to share it all, so bear with me. So today, on a Saturday morning when you're hopefully hanging around your breakfast table with your family, I thought I'd share our breakfast nook! 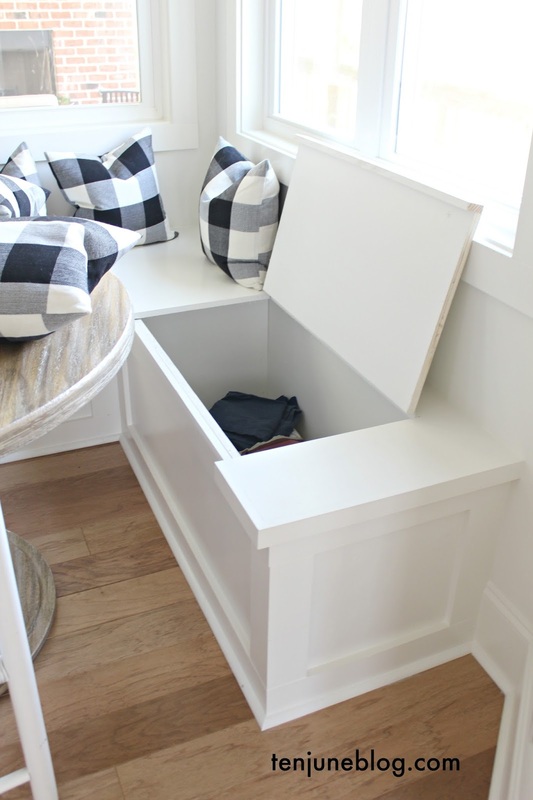 We designed this little "L" shaped corner with a corner bench in mind, and had our carpenters build in the bench (which opens on hinges for extra storage) during construction. 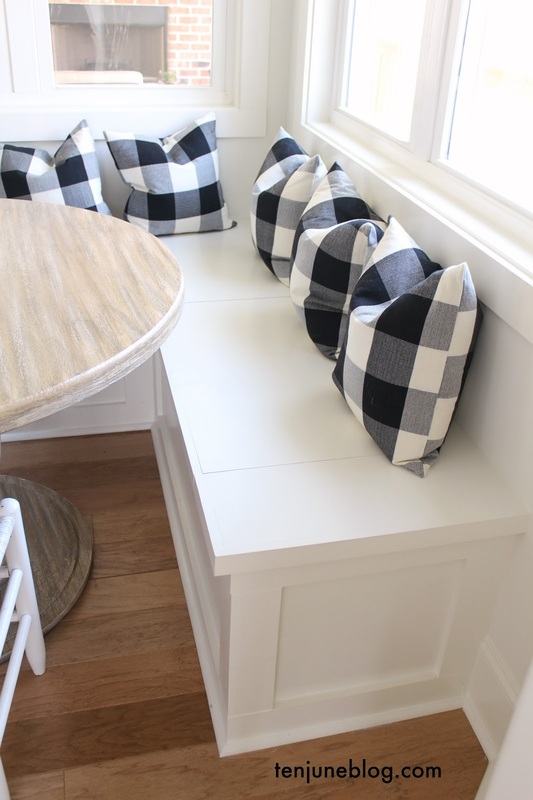 This space sits between the kitchen and the keeping room, so we wanted to tuck the table away in the corner so it doesn't block the flow of traffic. And now we've got an adorable, window-lined little nook for breakfast and, oftentimes, lunch! 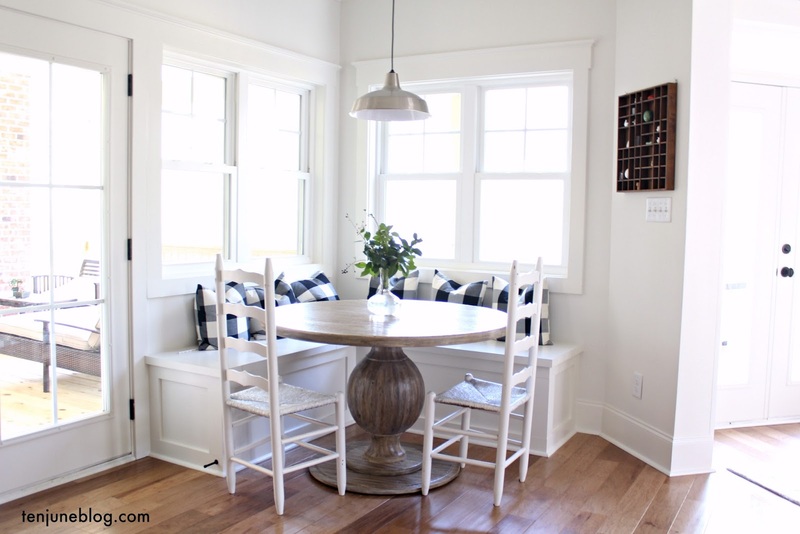 The kids love it and really enjoy having their friends over to eat with them in this space. Two questions for you on the light: 1) is it too small? 2) should I paint it brass or ORB?) Let me know what you think and thanks for the insight! Sources below! What a great little space. I know the kids will enjoy that spot for years to come. Perfect for game nights or putting puzzles together as a family too. 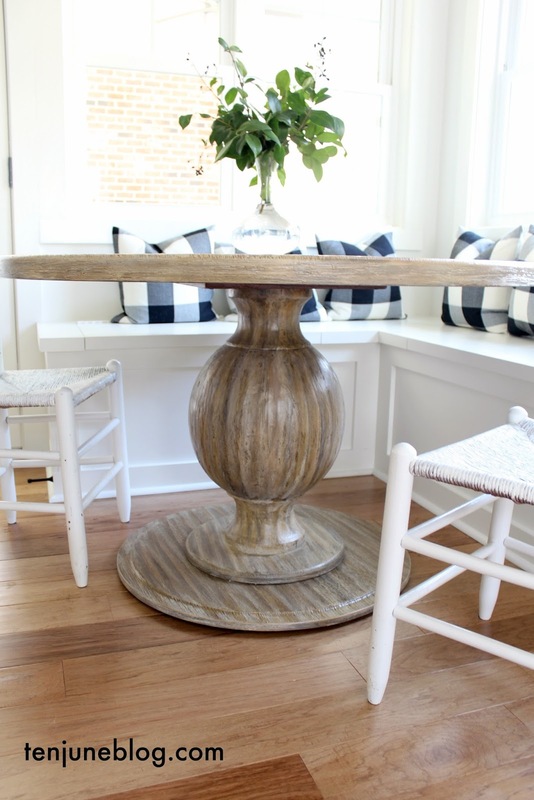 I know that I have seen a size guide on pinterest before regarding chandy size versus table size. I'll see if I can find it. It might help. In regards to color, I think painting it ORB would help anchor the area and it would stand out more. Right now I think it's more the color than size. It just seems to get lost. On a side note...spied the song lyrics in the other room. Do you mind sharing where you purchased. That is my hubby's FAVORITE song. Would love to purchase something similar. I love this space! I bought those pillow covers too! They looked really good with my red pillows at Christmas time. 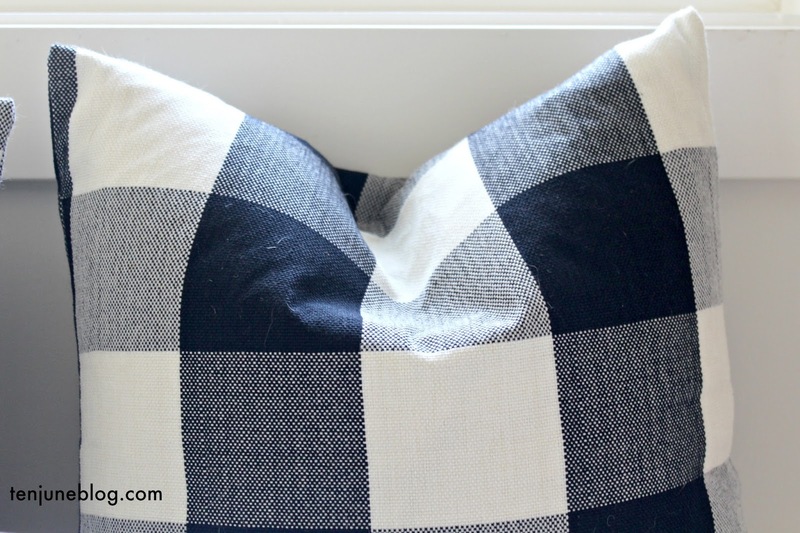 I have a new found love of buffalo check! 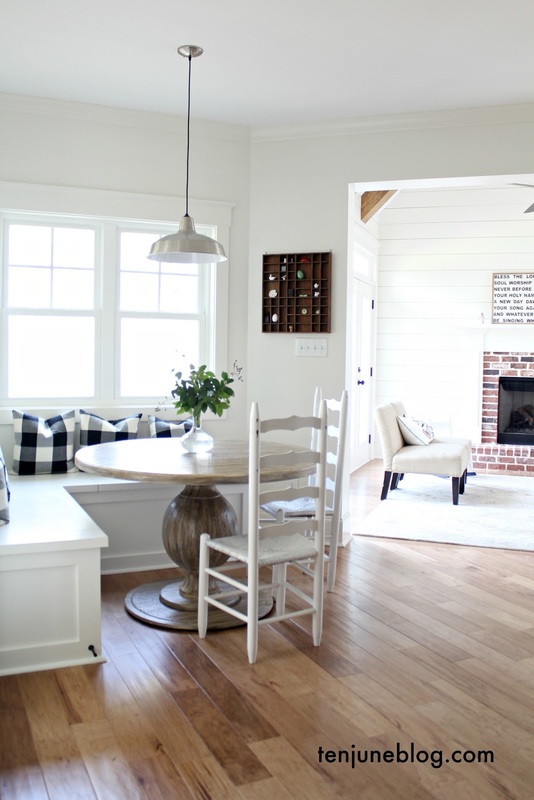 Have you seen the buffalo check-like area rug? Our Fifth House blogged about it I think. I think a light with a little more visual impact would look better over your table. Maybe something with similar colors/size to the ones Over your kitchen island? Or a large glass pendant? Pottery Barn has a couple that I have been contemplating! My vote is for painting the pendant ORB! I'd try painting the light fixture. I think if you go any bigger, it will be too much with the size of your table? I'm not expert though. I'd be interested to hear what Michaela thinks! I love this nook! So pretty & inviting! 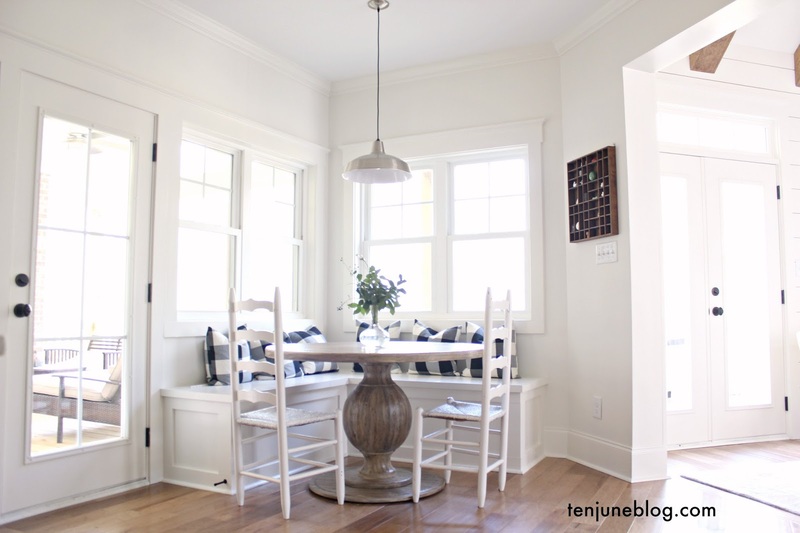 Your breakfast nook is insanely beautiful. Such a creative concept that works fantasticly. I kinda wanna copy it for my house, haha! Love it. I'm obsessed with this! The buffalo check! The storage! The table! The light! And those windows! What a wonderful spot! I love your wood floors! Would you mind sharing the details (color/wood type) on those?